Interested in art since childhood, Nagy took a more practical path as a career. When she moved to North Carolina in 1983 after graduate school, her interest in art was rekindled in response to the rich tradition of fine craft she discovered there. Throughout her 35 year clinical career, she was an artist by night and on weekends. It kept her centered and focused and provided her with an outlet for her creativity that she did not have in her psychology practice. While she lived in Raleigh, she attended classes at the NC State University Craft Center. She was primarily focused on pottery, but also learned to make baskets. 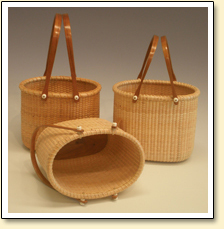 She focused on basketry when her professional work took her on the road as she could take baskets with her. A marriage of convenience, it blossomed into love! Learning from the masters in the craft, she studied traditional forms and techniques handed down through generations, perfected her skills and began incorporating her own ideas into her work. She joined the NC Basketmakers Association and taught classes at the local community college and art centers. Learning and sharing, she became part of a community of craftsmen. When she moved to Charlotte, psychology work again consumed her life, but she continued to carve out time to work on her art. She learned new techniques to increase her skill level and practiced, practiced, practiced. Nagy decided to take a "time out" from her clinical practice and return to her first love full time. She registered for clay classes at Clayworks and she took a studio in the arts district in Charlotte. Here she made baskets and shared her love of basketry with the public, bringing this art form increased attention and respect. The McColl Center for Visual Art selected her as an 11-month affiliate. There she pushed the boundaries of traditional basketry into sculpture and branched out into mixed media. After her experience at The McColl Center, with a group of four other artists, she formed an art collective, Charlotte ARTery. The group did pop-up shows initially, but secured a Knight Foundation grant to form a non-profit and get a full-time gallery space. About five years ago, she moved with her husband, Jim, to New Mexico. Initially moving to Santa Fe, they have since relocated to Placitas where she has found a home and a place in an interesting artist community. With her fiber materials and tools unpacked and her studio appointed, Nagy has resumed her art journey again, inspired by the rich culture and fine craft tradition of her new-found home. Moving forward, she continues to take her craft to a new level, adding new twists to traditional forms and incorporating found objects to produce the unexpected. 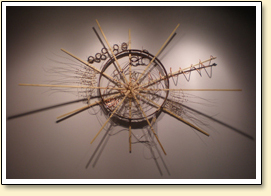 She continues to explore other materials and media in her effort to expand the role of basketry beyond the obvious to fine craft, worthy in its own right to be construed as "art" as it is assimilated into daily life.